Winner winner chicken dinner! 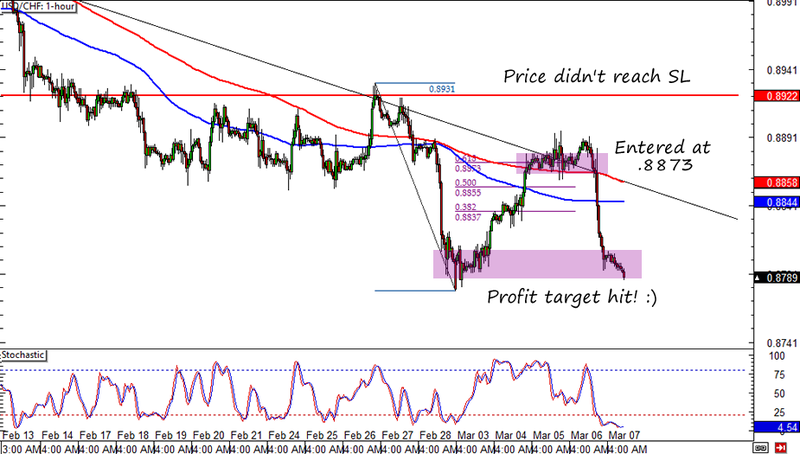 I got a lucky break on USD/CHF this week! A few days ago I shorted USD/CHF at market because it was in a good place from a technical analysis point of view and analysts had been expecting weak ADP and ISM non-manufacturing reports. Unfortunately for my day trade investors didn’t react much to the weaker-than-expected reports ahead of the BOE and ECB statements. I still held on to my trade though, since I thought that my direction and technical setup is still valid. I caught a lucky break yesterday when the U.S. factory orders showed a steep drop and risk appetite dominated the U.S. session trading. This week I pocketed 73 pips from USD/CHF which gave me a 0.73% gain for my account. Not bad for a couple hours worth of candlesticks! Fingers crossed for another good trade next week!